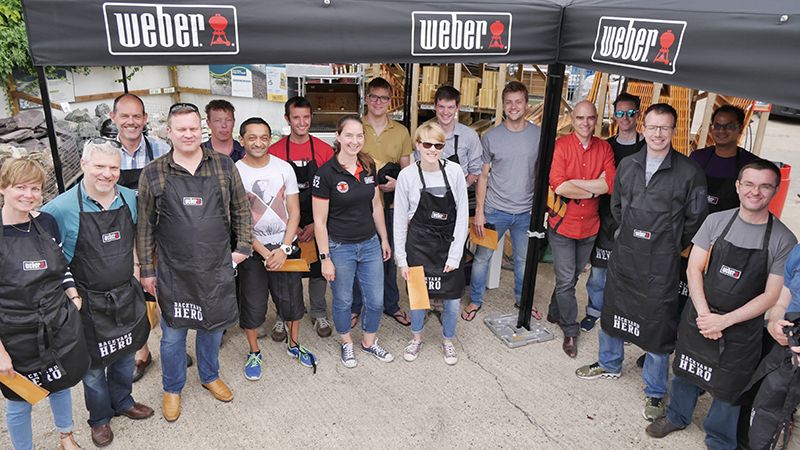 We held another successful Certified by Weber BBQ event at Sunshine Garden Centre on the 30th July 2017. The Certified by Weber events are a great way for experienced BBQ'ers to hone their skills. It's also a chance to help those with less experience learn various tips and tricks to become a BBQ maestro! The purpose of the Certified by Weber events are to run through the basic cooking methods - Direct Cooking, Indirect Cooking and 50/50. What better way to go through these methods than by trialing them with great food! For the event we used a Weber MasterTouch, Weber Q2200, Weber Genesis II E-310, Weber Genesis II LX E440, Weber Smokey Mountain 37cm, Weber Go Anywhere, Weber Kettle Plus and a Spirit Classic E-310 - using each was a great way of demonstrating various ways to enjoy alfresco cooking. On arrival, our guests were welcomed with ice cold beers and other refreshments, whilst one of our Weber BBQ Geeks, Daryl, smoked up some Chutney dip for everyone to enjoy with nachos. Our Certified by Weber chef, Barbara, quickly mustered up some pizzas and cooked them on The Weber Genesis II LX E440 with the aid of a Weber Pizza Stone - these pizzas were incredible - cooked on the top and crispy on the bottom - absolutely delicious! While enjoying the pizzas, little did our guests know that before they had arrived, Barbara had been smoking sausages on the Weber Smokey Mountain 37cm with some Cherry Wood Chunks. These were delicious but the real favourite was the incredibly tangy BBQ sauce that had also been smoked for over 90 minutes - perfect for dipping! In case you don't have the recipe for this, please see below. Next up was a Risotto - who would have thought you could BBQ a Risotto? Well you can! We used the GBS Weber Wok and gradually added the ingredients - while some were stirring others were grilling some Cod and Chorizo Kebabs to add to the Risotto. The Risotto was delicious, it had a smoked BBQ flavour that many of the class were not expecting. Next up, how to cook the perfect steak on a portable Weber Go Anywhere BBQ - do it well and you'll never cook a steak in your kitchen again. Why? Well because the heat that you can achieve on your cooking grates is higher than what can be achieved on a pan in your kitchen - this means, locking in all the wonderful flavours of a good steak through searing. Season well, heat up your BBQ so that not just the air temperature is hot, but also the cooking grates and cook directly with the BBQs lid on. TOP TIP - Only open the lid when turning and taking off the steak! Roast chicken, burgers and chips were next on the menu - quite a main course! Chips can often disappoint on a BBQ but not with the help of the Weber Fine Mesh Rotisserie Basket which meant the chips came out cooked through and crispy! The chickens were cooked using various Weber accessories that facilitate the Beer Can Chicken technique and the burgers were cooked as burgers should be - over very hot direct heat in a Weber! If all of this food was not enough, something pretty special was to come, BBQ'd Apple Tarte Tatin! Simple to make, even simpler to eat - this was glorious and topped off a great fun afternoon. What a genuinely great group of people that came up to Sunshine for the afternoon - it was a great day and it was fantastic to see some familiar faces and meet some new!